Nautica - for Warhammer fantasy battles: The Nauticans grab a new look - just in time for Warhammer 8th Edition ! 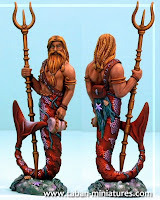 The Nauticans grab a new look - just in time for Warhammer 8th Edition ! I found a nice-to-look at "sea view" for the finned men, mermaids and creatures from the deep.